Jim McAdam has just returned from a 2 –week visit to the Falkland Islands and southern Chile under the auspices of the United Kingdom Falkland Islands Trust. While in the islands Jim gave a public lecture on the potential implications of climate change on agriculture and visited the Government Research Farm at Saladero. There he saw some shelterbelt plantations he had been instrumental in initiating almost 20 yrs ago, reseeding trials and native pasture utilisation. 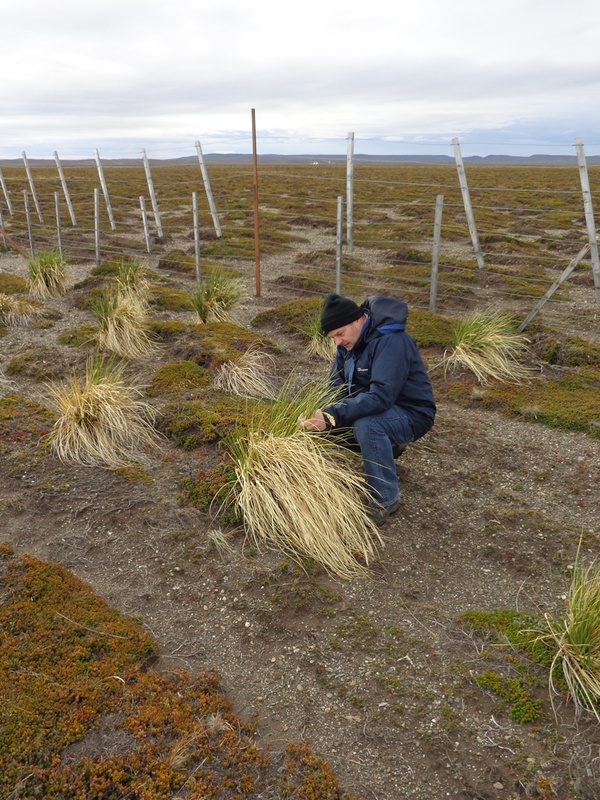 Local conservation organisation Falklands Conservation was keen to show Jim trials using native grasses to restore some heavily (very!) eroded areas. He also met with the Governor, The Rt Hon Colin Roberts, Director of Education, Tom Hill , Head of the Dept of Agriculture Ian Campbell, Senior Agronomist Adam Dawes and Head of Renewable Energy Resources in FIDC, Andrew Crighton. In Chile he and, Dr Sergio Radic visited some plots where Tussac Grass grass (Poa flabellata) has been used to enhance current forage quality. 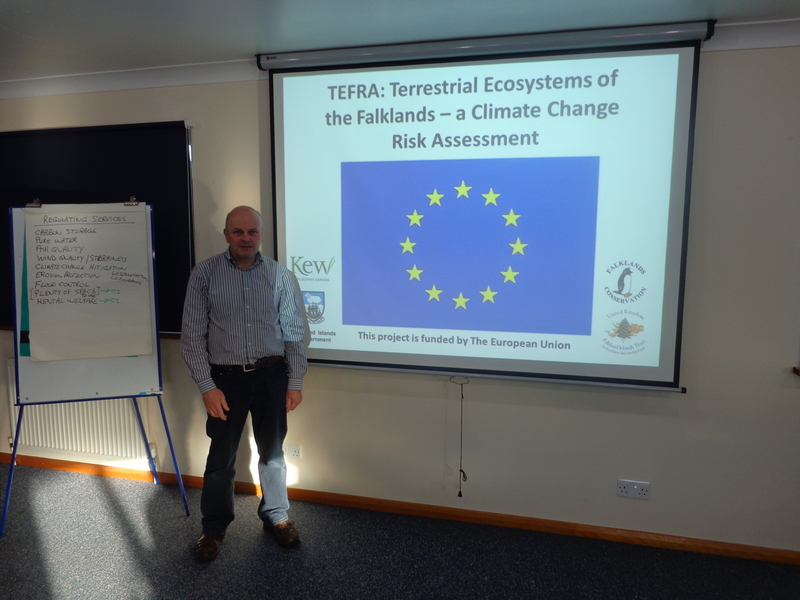 The Trust’s consultant, Jim McAdam gave a remote presentation to a group of farmers in the Falklands on the potential of climate change of agriculture in the Islands, as part of Farmer’s Week 2015. Farmer’s Week is an annual gathering of stakeholders concerned with agriculture in the Falkland Islands. At the 5th International conference on the effect of fires on soil properties (FESP5), the potential impacts of and risks associated with burning vegetation in the Falklands were highlighted. 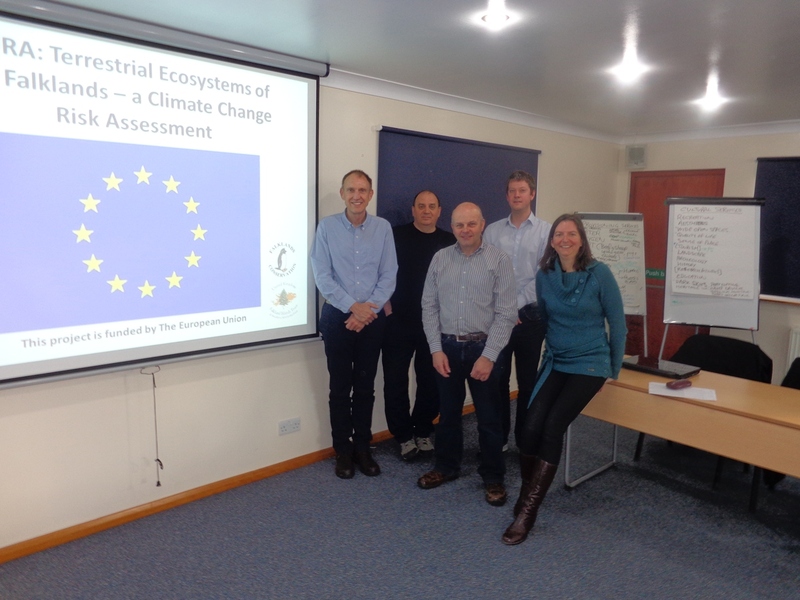 In the paper presented, Jim McAdam, Rebecca Upson and Rodney Burton reviewed the peatlands of the Falklands and presented current estimates of peat extent, type and carbon storage potential. Recent climate change predictions were aligned with an overview of the practice of burning the pastures in spring to highlight concerns of the effect of fire on biodiversity and the carbon storage potential of these shallow, extensive peatlands. 1.McAdam J H (2013) The impact of the Falklands War (1982) on the peatland Ecosystem of the Islands. In ; Rotherham I & Handley C (eds) War and Peat. Wildtrack Publishing, Sheffield. Vol 10 (2013) of Landscape Archaeology and Ecology pp 143-162 Summary. Although the Falkland Islands (52°S) are relatively small (12,000km2) they are a globally important peatland resource. Most of the soils are classified as peat which has been formed under a unique set of climatic conditions and location-specific circumstances. Their estimated carbon stock is equivalent to 66% of the UK total and more than that of Ireland. The Falklands War in 1982 was essentially fought on peatlands. However the timing of the action (winter), the relatively short duration of the land conflict and the unpreparedness of the combatants for the peatland conditions meant that overall impact on the ecosystem was minimal. A small but significant area of minefields is an unwelcome human legacy (which may have some ecosystem benefits) but a greater number of military and other tourists visiting the main battle sites has the potential to increase awareness of the peatland ecosystem. 2.McAdam J.H. (2013)The impact of the Shackleton report on developments in the Falkland Islands post-1982. Summary. In 1976 the Labour Peer Lord Edward Shackleton was asked to produce an economic survey of the Falkland Islands focusing on their current viability and development potential. His main findings were that the Falklands were suffering from decapitalisation (there was a net gain to the British exchequer over a 20 year period) and that there was significant natural development potential (e.g. fisheries and hydrocarbons). He also made recommendations on fiscal procedures and infrastructure. His main recommendation was that the large company own farms should be sub-divided and sold as individual family run units – very radical agrarian land reform for the late 20th century. The report was largely ignored. During the Falklands War, Prime Minister Thatcher asked Lord Shackleton to revisit his 1976 report, update it and make recommendations for the post – war development. Shackleton did not change his initial report much and the added impetus (and money) given by the Thatcher Government meant that most of the recommendations could be implemented. The Falklands subsequently prospered, eventually becoming (by 1988) financially self-sufficient from Britain. Farm sub-division had a largely positive effect on rural infrastructure. Margaret Thatcher’s willingness to support what was essentially a Labour-driven programme is significant and her legacy in the Falklands post – 1982 is essentially one of implementation of the Shackleton report recommendations. The Trust’s consultant, Prof. Jim McAdam, recently contributed to a climate change workshop in the Falkland Islands. 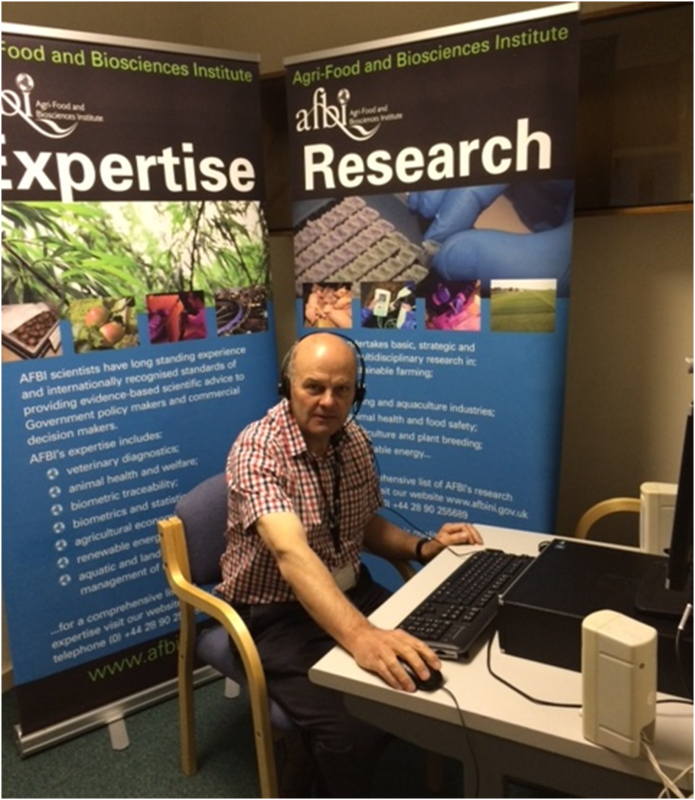 The Trust’s long-time Consultant, Professor Jim McAdam , Queen’s University Belfast and the Agri Food and Biosciences Institute, was awarded an OBE in the 2014 New Year’s Honours list. 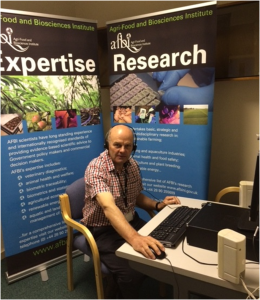 Jim’s award was for “Services to agriculture and research in the Falkland Islands” and reflected over 38 years of involvement in agricultural research and development in the Falklands. 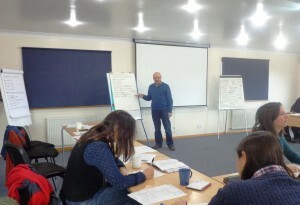 Jim’s work in connection with the Falklands included working with the United Kingdom Falkland Islands Trust (UKFIT), sitting on the Academic Committee of the Shackleton Scholarship Fund and editing the Falkland Islands Journal (since 1991). Jim’s award was presented by Prince Charles, which was highly appropriate as the Prince had visited the Falkland Islands in the past and showed a keen interest in the current state of farming on the islands. Our President, Sir Rex Hunt, died on 11th November 2012. He will be sorely missed by the Trust for his knowledge of the Falkland Islands, and its people, and his wisdom in our deliberations over 25 years. 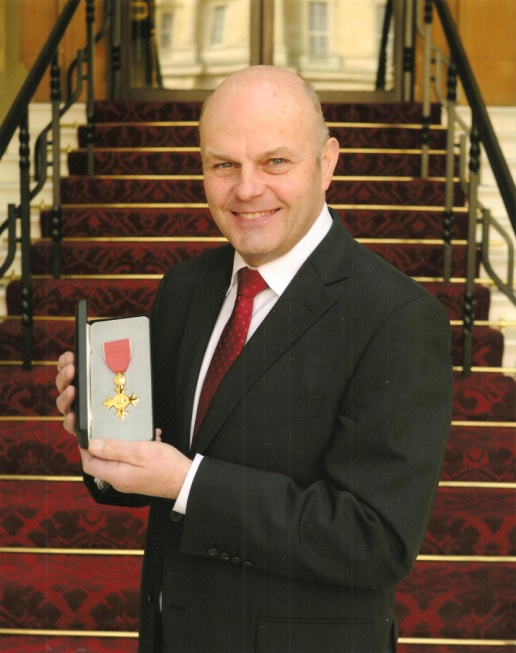 Sir Rex first became a UKFIT Trustee in 1987, not long after his retirement as Governor, and return to the UK, and served until 2011. He became our President in 2006 on the retirement of Lord Strathcona, and continued in that office until his death. In January 1995 he was the UK based co-ordinator for the launch of the Shackleton Scholarship Fund (SSF), chairing the UK Committee from inception, and working closely with the then Governor, David Tatham, and the Committee in Stanley in the initial fundraising. The success of the Appeal for funds for the SSF in the UK owed much to his energy and enthusiasm, as did the development of the SSF in its early years. He retired as Chairman of the UK Committee in 1999, but continued as Hon Treasurer until the end of 2001. The 30th anniversary of the formation of UKFIT on 1 June 1981, was commemorated at a Reception at Falklands House in London on 7th September 2011 which celebrated our past achievements, and highlighted current projects. The occasion also celebrated 16 years since the Shackleton Scholarship Fund (SSF) was launched by the Trust in 1995. The Reception was hosted by the Falkland Islands Government Representative in London, Ms Sukey Cameron MBE, and attended by Trustees and Officers of the Trust and the London Committee of SSF. Our Patron, Her Royal Highness Princess Alexandra, was our guest of honour. Princess Alexandra visited the Falklands in February 2000 when she inspected the work of the Trust and SSF scholars’ projects, met local people involved, and learned about plans for the future. The Alexandra Wood at Port Howard was later named in her honour. investigation of the evidence for climate change in the Falklands and adjacent regions, its likely impact, and feasibility of mitigation. At the conclusion of proceedings, Princess Alexandra was presented with an inscribed copy of the Dictionary of Falklands Biography by its editor Mr David Tatham, as a memento of the occasion.